New York - North Korea's foreign minister brushed aside US President Donald Trump's fiery threat to destroy his nation, comparing it to a "dog's bark" and suggesting Pyongyang would not be deterred by the rhetoric. 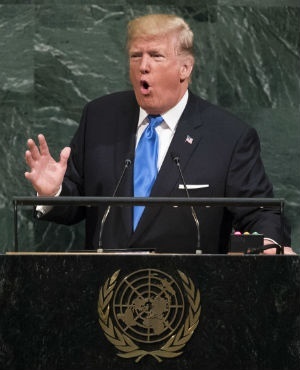 Trump used his stormy maiden address at the UN General Assembly on Tuesday to warn the North that Washington would "totally destroy" it if the US or its allies were attacked. Arriving in New York for the UN meetings on Wednesday, North Korean Foreign Minister Ri Yong-ho was mobbed with questions from reporters about the Trump speech and replied with a proverb. "There is a saying that marching goes on even when dogs bark," he said as he entered his hotel. "If they are trying to shock us with the sound of a dog's bark they are clearly having a dog dream." Isolated and impoverished, North Korea says it needs a sturdy nuclear deterrence to protect it from an aggressive US, and the autocratic regime has made militarism a central part of its national ideology. Pyongyang's stated aim is to be able to target the US mainland and the nation has flaunted the advances in its weapons programme in recent weeks, with the September test of what it said was a miniaturised hydrogen bomb capable of being loaded onto a rocket. When asked by reporters what he thought of Trump calling the North Korean leader "rocket man", Ri quipped: "I feel sorry for his aides." Japan's Prime Minister Shinzo Abe told the UN that dialogue with the North would not work. The comments are likely to dismay China - the North's only major ally and trading partner - which has consistently called for a resumption of talks. Observers say despite the tough rhetoric, any military response to the crisis would risk a devastating conflict that would imperil millions. The North has fortified its southern frontier with a hefty arsenal of artillery that has South Korea's capital, Seoul, just 55km away, in its sights. Japan is also within range of missile strikes.